Are digital cameras out of the picture? 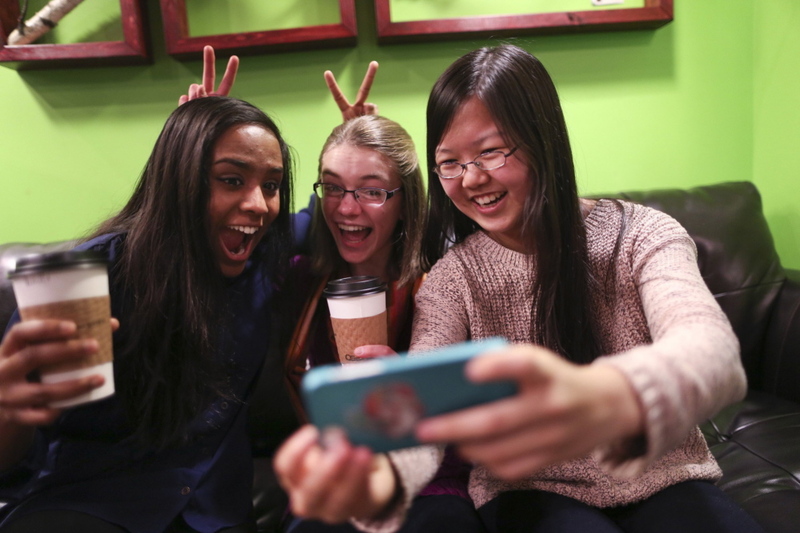 Consumers choose smartphones’ link to social media over image quality. It’s a modern paradox: People are taking more photographs than ever before, nearly 400 billion this year, yet sales of cameras are shrinking. 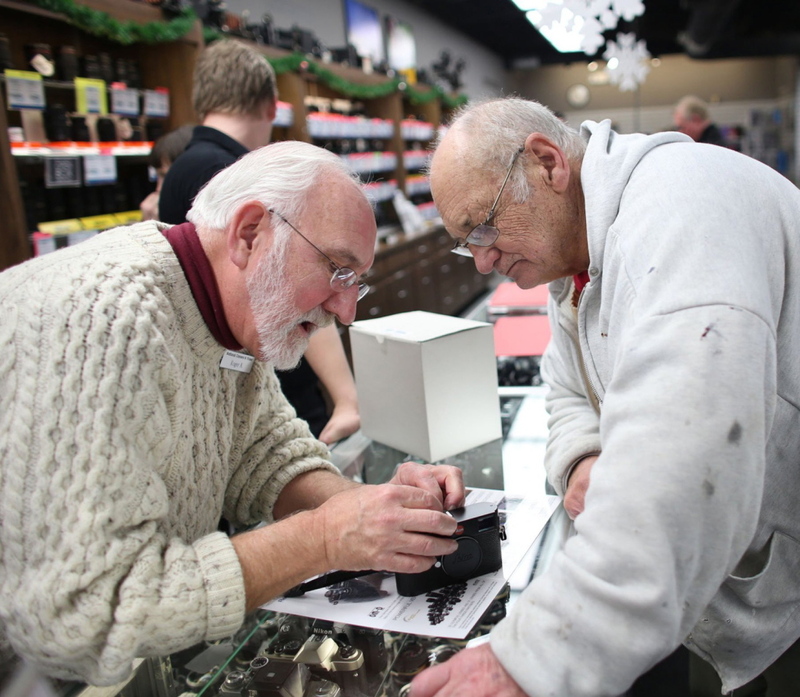 Roger Knight, left, works to set up Wes Sunvold’s new digital camera at National Camera Exchange in Golden Valley, Minn.
And the obvious reason for the decline? The ubiquitous smartphone – a combination mobile phone, personal computer, data storage unit and camera, small enough to fit in a pocket. Nearly 60 percent of U.S. homes now have one, compared with 70 percent of homes that own more than one camera, according to The NPD Group. Amanda Brady of Castle Rock Township, Minn., recently purchased Nokia’s new Lumia 1020 smartphone with a camera that sports 41 megapixels. She uses it for shots of her artwork to put on Etsy.com but also for nature pics during a recent family vacation to the Black Hills. “We print quite often, and they don’t look pixelated,” she said. It’s a culture shift that many believe started with the release of Apple’s iPhone 4 and 4S in 2010-2011, the first smartphones to have a backlit-illuminated sensor to produce brighter pictures with accurate colors to rival the quality of a decent point-and-shoot. Camera manufacturers such as Canon and Nikon, whose stocks have lost more than half their value since the iPhone was introduced in 2007, tried to stop the free-fall this holiday season with aggressive markdowns. The lower prices were expected to increase sales nearly 10 percent, Arnold said, but sales on digital single-lens reflex cameras increased only 1 percent compared to last year. While many in the camera industry were hoping that consumers would continue to buy traditional cameras for lasting, better-quality pictures, Chute said that’s not happening. Consumers don’t care as much about image quality as they do the software that allows them unlimited, immediate sharing on social networks such as Facebook and Instagram, mobile image editing and manipulation, and cloud-based backup. “Image quality is now second to connectivity to Web services like Facebook,” he said. One Minnesota specialty retailer, National Camera Exchange, isn’t ready to accept that. It’s pouring talent and resources into enlightening customers about what they’re missing by using only a smartphone. When National Camera Exchange President Jon Liss shows young parents close-ups taken with an SLR of a friend’s daughter swinging the bat during a T-ball game, they ask how he did it. “They don’t know that these cameras are better,” he said. Brady, 34, said she’s never going back to a traditional camera. She recently took a picture of her son caroling at a nursing home from 40 feet away. “I leaned in, zoomed in, took the shot, edited it, and I was done,” she said. “I didn’t have to watch the rest through a little lens. I could actually enjoy the show,” she said. Brady said that even if she went on the trip of a lifetime and got to see every church in Italy, she’d pack her smartphone, not a standard camera. “I love my Nokia,” she said. That kind of customer worries retailers. At National Camera, a nearly 100-year-old company with five locations in Minnesota’s Twin Cities, 2013 has been the first year that sales of point-and-shoot cameras were down significantly, Liss said. “Our point-and-shoot sales were down about 22 percent, which is about half of the national decline of 40 percent,” he said. He attributes the decline to smartphones and Amazon.com Inc. The company is focusing on customer service and education to keep customers rolling in, said Adam Prybelski, National Camera’s omnichannel sales manager. The number of customers enrolling for classes on basic studio lighting, digital SLR, sports photography and portrait-taking is up 30 percent in 2013. “Our long-term strategy is teaching people what their camera can do for them, whether it’s an iPhone or point-and-shoot,” he said. The retailer doesn’t yet offer classes on how to take better photos with a smartphone, but it’s considering it. But they also want to make the pitch that their expertise trumps buying cameras, accessories and processing online or at big-box retailers that sell electronics. “And we price-match, too,” Liss said. Even though overall camera sales are declining, analysts aren’t expecting big-box retailers to shutter their photographic departments yet. Instead, they’re shrinking the number of camera options, even in accessories, said Brian Yarbrough, a retail analyst at Edward Jones. Retailers are de-emphasizing camera departments by putting them in less-desirable parts of the store and putting the spotlight on higher-profit-margin items such as smartphones and tablets. Other camera businesses are feeling the shift as well. Repair shops are disappearing, and those still hanging on are seeing a drop in business. Low-end point-and-shoots aren’t cost-effective for repair, and some manufacturers won’t provide parts to independent shops so they can keep repairs in-house, said Gus Gulbranson of Northwest Camera and Video Repair in Lindstrom, Minn.
His overall business has been decreasing for the past two years. “With the decrease in sales from phones, I’m not expecting that to get much better,” he said.